RHODIA STILON S.A. Gorzów Wlkp. dismantling of complete textile plant in Cottbus, transfer to Gorzów, assembly and start-up in Stilon Gorzów Wlkp. manufacturing and assembly of steel and energetic constructions (industry installations), manufacturing and assembly of ventilation installations, central heating and water-sewage systems. VOLKSWAGEN ELECTROSYSTEMS Sp.z o.o. Gorzów Wlkp. manufacturing and assembly of ventilation installations, central heating, water-sewage and warm distribution systems. manufacturing and assembly of ventilation installations. assembly of line for casting cleaning-up. PKN PETROL STATIONS Myśliborskastr. Gorzów Wlkp. 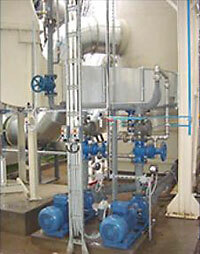 manufacturing and assembly of central heating installation, as well as ventilation and water-sewage systems.